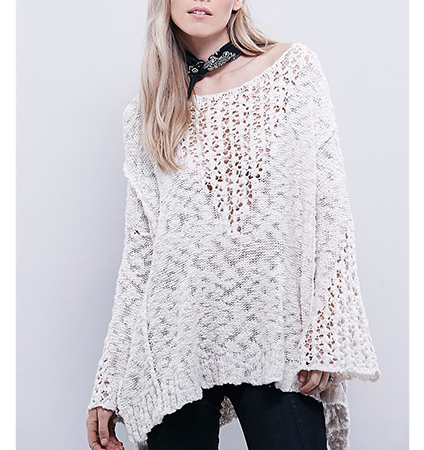 The asymmetrical hemline of this loose fitting sweater is but one of its many fabulous features. The garment is presented in a nice shade of off white. It is constructed with a loose weave that is semi-sheer, revealing whatever the wearer decides to wear underneath. The neckline is round and wide. The sleeves are long and belled. The length of this garment reaches to the mid-thigh area at its longest point, and to just below the hips at its shortest. We recommend dry cleaning only for this sweater. It is available for purchase in sizes Small, Medium, Large and Extra Large.